Last year I acknowledged that I had been in a bit of a rut when it came to decorating my mantel for Christmas. So for 2017, I changed things up by creating a Mad For Plaid Christmas Mantel. 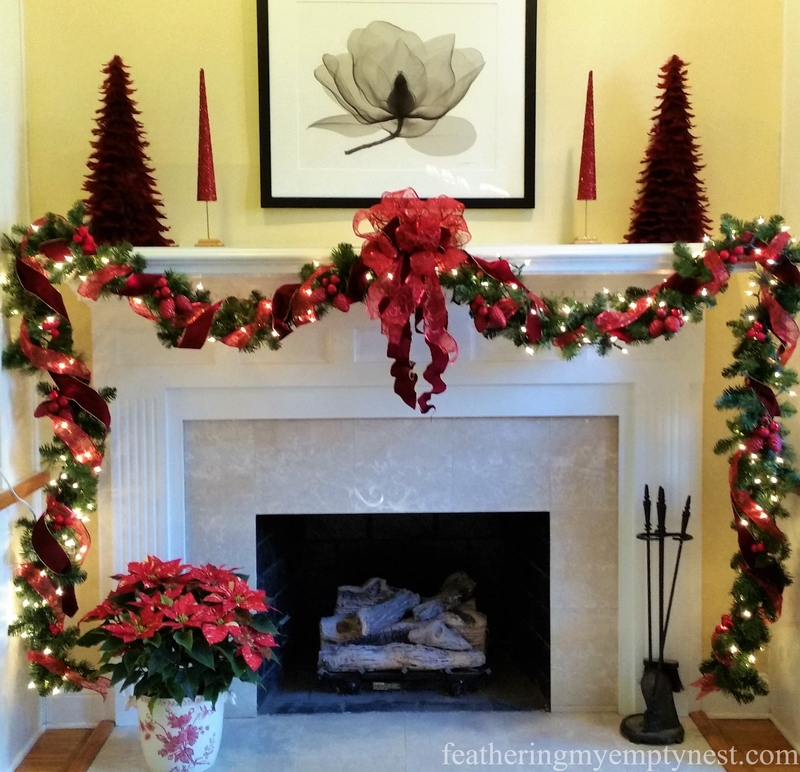 Last year’s plaid themed Christmas Mantel which featured a fresh garland which I created using magnolia branches from my yard. 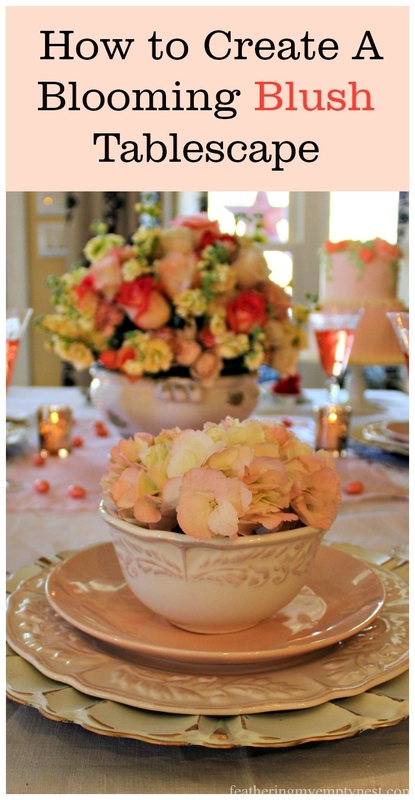 While I loved the fresh magnolia garland, I didn’t feel like making another one this year. However, when I pulled out the pre-lit faux garland that I usually use, I found that the middle section wouldn’t light. Anybody who has ever used these pre-lit garlands knows how frustrating this is. I tried replacing each bulb on the unlit part as well as the fuse, but nothing worked. There was nothing to do but go on a hunt for new garland. 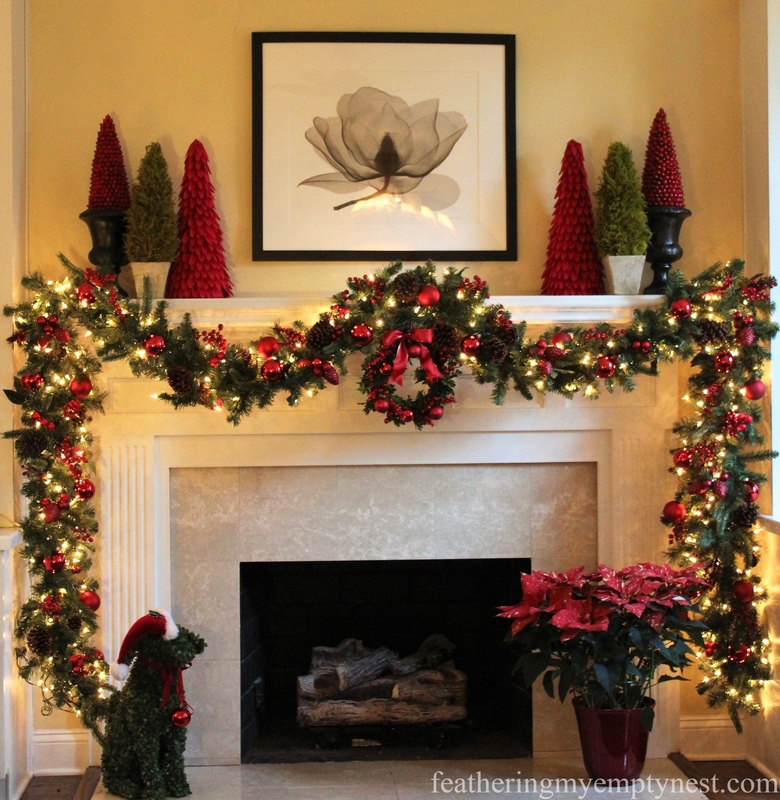 This beribboned garland was one that I used on my Christmas Mantel for several years. While I still think it was pretty, it does seem a bit dated now. Since I wanted to decorate my Christmas mantel right away, I didn’t have time to order something online. I feared that since stores had begun displaying their Christmas merchandise before Halloween, it would be slim pickings. Fortunately, I went to the Home Depot first. There I found these very reasonably priced Martha Stewart Winslow Fir 9-foot pre-lit garlands. Not only did they have 100 lights, but they also were adorned with a few pine cones and faux berries. Because I swag my garland and let it fall almost to the floor, I would need two 9-foot strands. However, from experience, I have learned that faux garland is never as full as I would like, so I bought four packages of garland so I could double them up. When I got them home, I wired two strands together (one on top of the other), repeated this with the other two strands, and then wired the doubled strands together end to end. Command strips were not a thing years ago when we moved into our house, so our first Christmas in our home I desecrated my wood mantel top with three nails. Because the damage was already done, every year since I have used those same holes to place the nails I use to hang my garland. After I was sure that the garland was well secured to the mantel, I proceeded to spend a ridiculous amount of time fluffing and separating each evergreen bough. 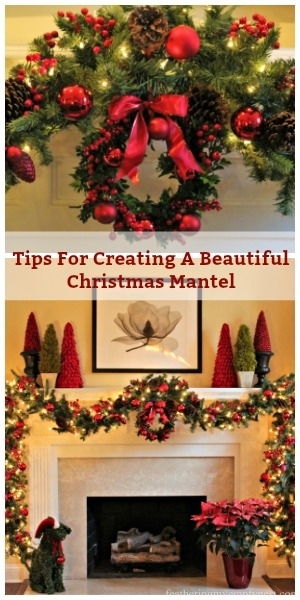 Because I attach my garland to the mantel at the center and then swag it down and then up to edges where it falls to the floor, I like to direct the branches downward away from the center on both sides for a more natural look. 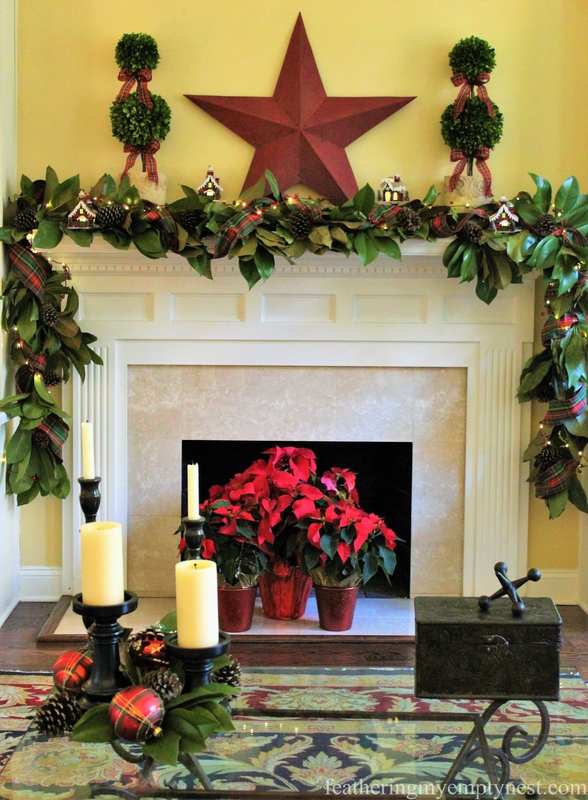 You can see that I have angled the branches on either side of the center of the garland to point toward the edge of the mantel and then down toward the floor. My ribbon was looking a little tired, so I decided to forgo ribbon and just load up the garland with more berries, pine cones and lots of glass ornaments. I like to pick one predominant color when decorating for Christmas. 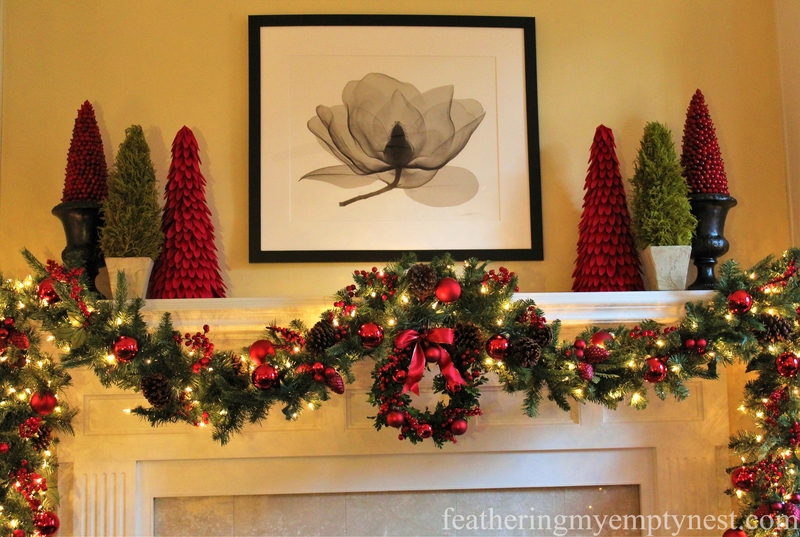 Since red has always been my favorite color and it works well with my decor, I chose all red embellishments for my Christmas mantel. However, you can achieve this look with any color, as long as you stay mostly monochromatic. 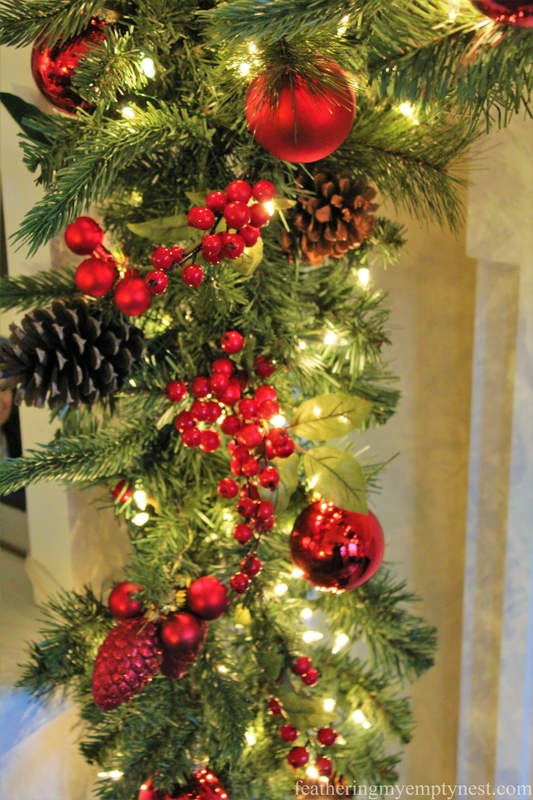 Faux red berries, pine cones, and red ball ornaments in different finishes and sizes are wired to the pre-lit garland for a full, lush look. I wired each ball, berry, and pine cone onto the garland using 22-gauge floral wire. It’s a bit time consuming, but as I will hang the fully decorated garland from hooks on the wall in my storage area when I take it down, I won’t have to do it all over again next year. Once I got all the ornaments on, I stood back and felt it was screaming for some sort of decoration in the center. I tried a bow, but it just didn’t feel right. I finally decided to hang a small faux boxwood wreath from the center, and I love the way it turned out. 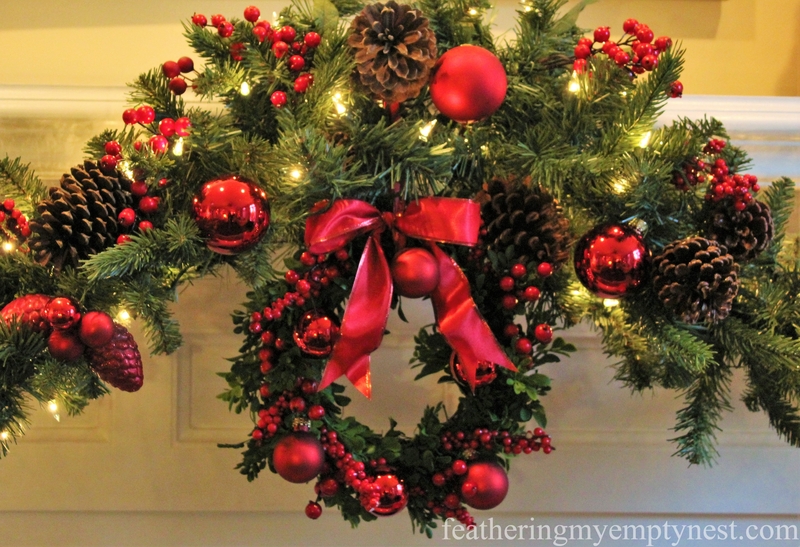 A small faux boxwood wreath embellished with the more red berries and ornaments hangs from the center of the garland. 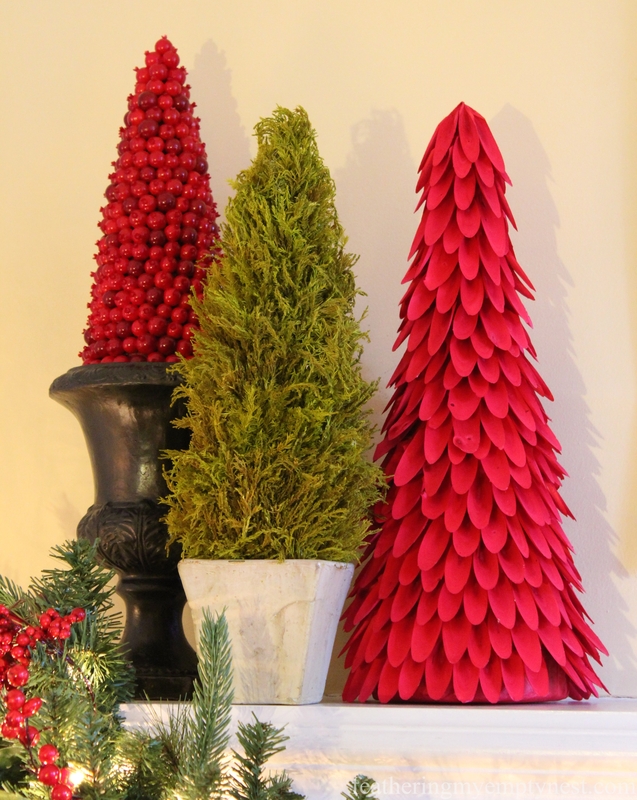 On top of the mantel, I created a symmetrical arrangement of tabletop trees. Keeping to my red color scheme, I used large red curled wood trees and faux cranberry trees (purchased from Target several years ago). 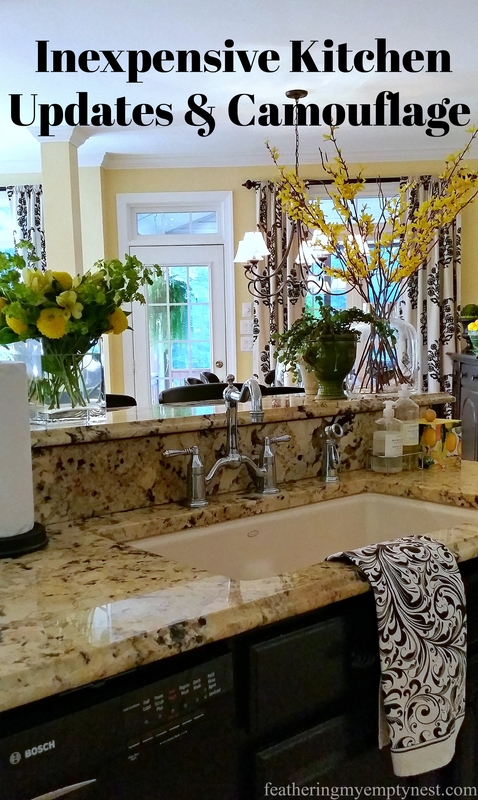 To break up the red a bit, I added a pair of preserved lemon cypress topiaries. 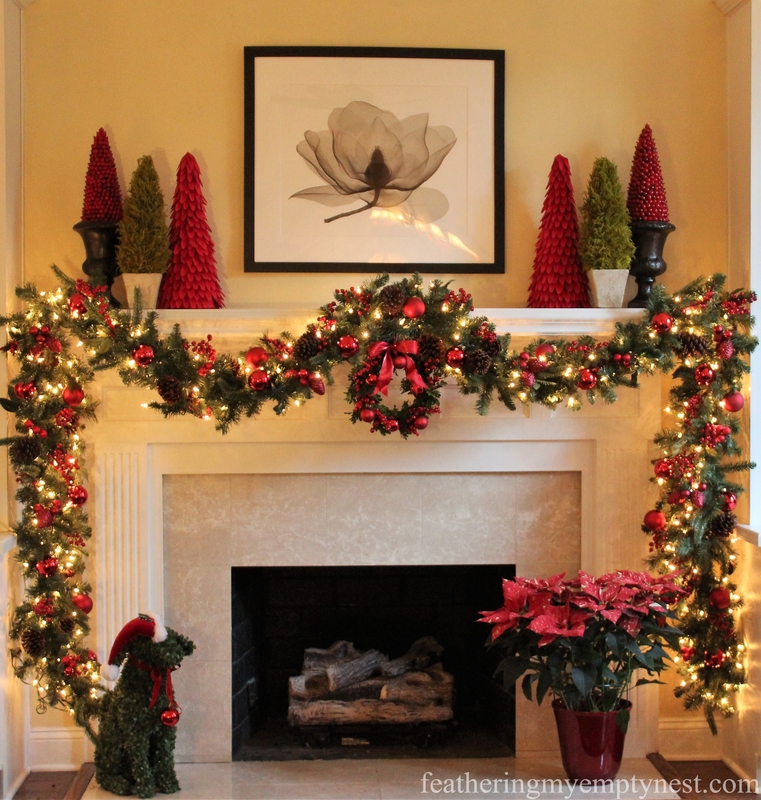 A trio of festive topiary trees brings height and color to the top of each side of the mantel. 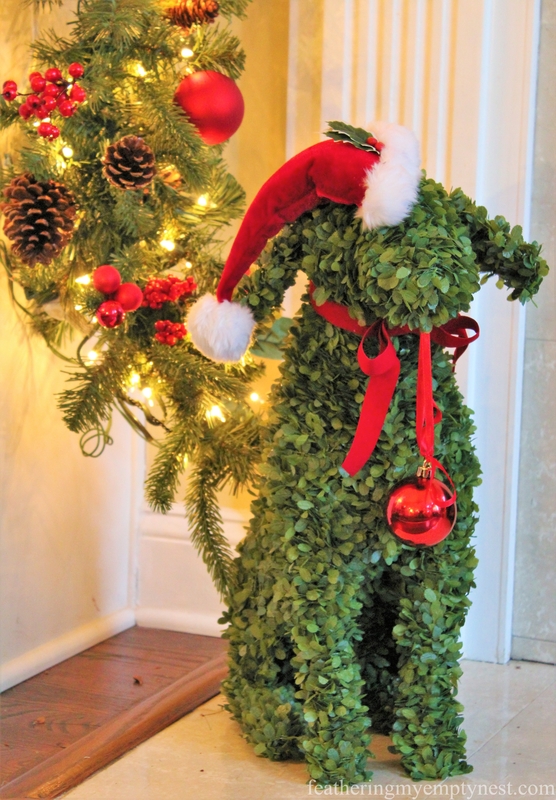 I always place a large red poinsettia on my hearth at Christmas time, but this year I couldn’t resist this faux boxwood topiary Santa dog I found at Michaels. A cute faux boxwood dog sits on the hearth waiting to steal some of Santa’s cookies. While it was really irritating to have the lights on my old garland die, It did give me the opportunity to create a whole new look for my Christmas Mantel this year. Now that it’s all decked out, we just have to wait for Santa to come down the chimney. I am so in love with that boxwood dog! Wishing you and yours a very happy holiday season! Thank you very much for commenting. I couldn’t resist that puppy. Merry Christmas!